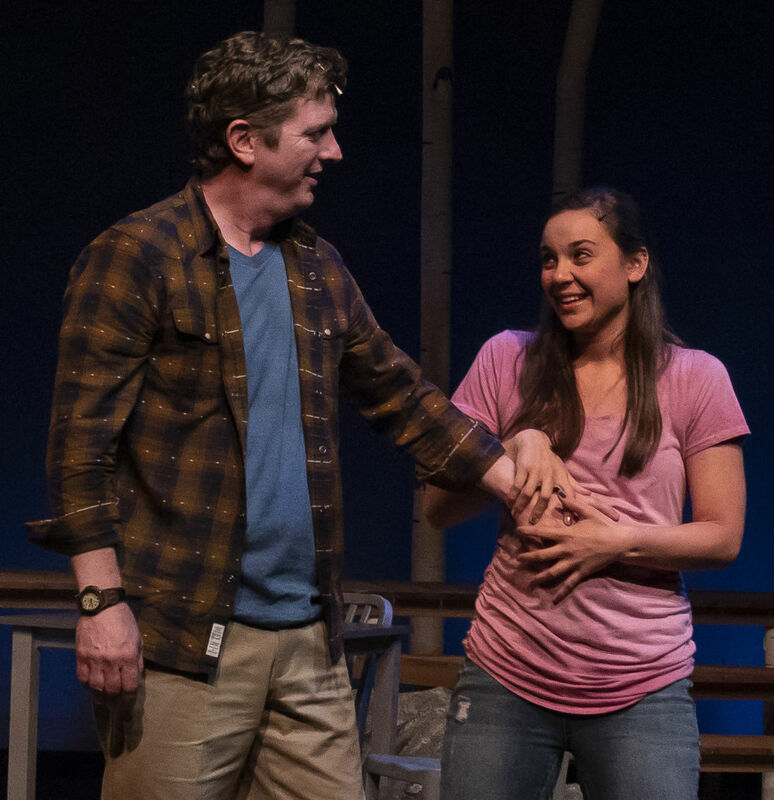 David Smilow and Rachel Moulton in Wednesday's Child. 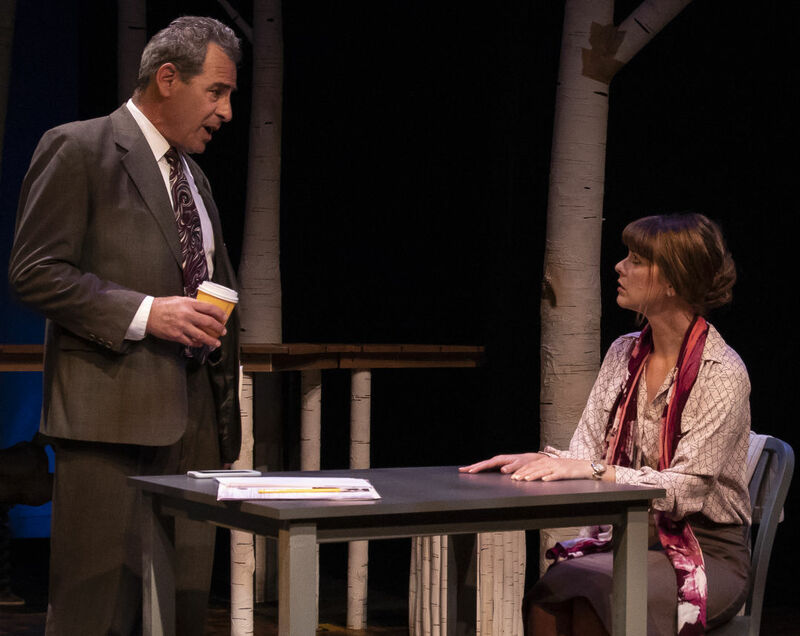 Mark St. Germain’s world premiere play, Wednesday’s Child, now onstage at Florida Studio Theatre’s Gompertz Theatre, touches on issues ranging from infertility, surrogacy and abortion to what happens in the afterlife and how we all fit together in the big picture of humanity. But honestly, what will probably keep most audience members tuned in is the murder mystery that stirs the plot. We know from the very outset that college student Becca (Brooke Tyler Benson) is dead; she’s speaking to us from a sort of ghostly boardwalk with denuded trees, hanging lights and a gently moving tire swing in the background, telling us that she wants to find out who killed her. We also know her death is tied somehow to her connection with Martin (Duke Lafoon) and Susan Merrit (Rachel Moulton), a couple unable to have a child on their own who have hired her to be their surrogate. Martin, an archaeologist, and Susan, a space stager, seem very happy, aside from that lack of a child, and their initial meetings with Becca go well. Becca is bright, she’s done her homework on surrogacy, and she’s clear about doing it for the money, even if she’s less clear about what her focus in life will be, changing her choices rapidly from biology to musical theater to business. Just out of an intense relationship, she’s comfortable with the attention the couple showers on her. But rifts start to develop, especially with the appearance of one of Becca’s former professors (Heather Michele Lawler). The cops investigating the case are a familiar sort of odd couple duo: the older, wisecracking tough guy (David Smilow) and the younger Latina (Alicia Taylor Tomasko), who, by the way, longs to adopt a baby herself. They banter a lot when not questioning their suspects or tangling with the aging hippie lawyer (Susann Fletcher) the Merrits call in for help. Much of this part of the piece plays like a television cop show, but St. Germain writes adroitly enough to keep us wanting to watch. The cast, under Kate Alexander’s direction, likewise makes us want to know more about each of them, not just Becca. They, and we, are asking questions about why people want or don’t want to have children in the first place, and about the wisdom of their choices in a deeply flawed world. And the final scene of Wednesday’s Child ties together some of the themes St. Germain has raised throughout, especially in relation to Mark’s archaeological work. The play, which has been under development at FST for two years, has no doubt seen a lot of changes from its first incarnation. 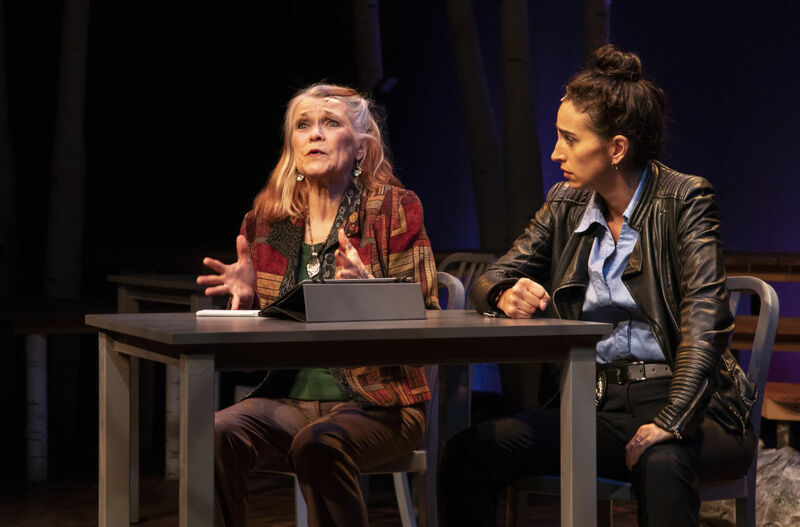 If further tweaks could somehow bring a bit more depth to the characters and more plausibility to some actions without sacrificing the basically satisfying pacing or storyline, Wednesday’s Child could find a theatrical life beyond its staging here. Wednesday’s Child continues through May 24; for tickets call 351-8000 or go to floridastudiotheatre.org.